A very rare and extremely favoured edition of the Pantheon of Ajarn Chum Chai Kiree and the Khao or Masters of the Dtamnak Dtak Sila Khao Or Southern Academy of Sorcery. The Pra Roop Muean Somdej Pra Puttajarn (Dto) Prohmrangsri 2511 BE Amulet is known for its authentic power, being blessed and empowered through the Sacred Magical 'Sadej Glab' Ceremony at Wat Tham Khao Ngern, which is so historically famous for the miracle of amulets finding their way back to their maker, like homing pigeons. Many people also call this amulet the 'Roop Muean Ajarn Tong Tao' and assume the image to be that of Ajarn Tong Tao, founder of the Dtamnak Dtak Sila Khao Or Southern Academy of Sorcery. This is due to the image of the monk sitting in the posture of holding a Kampira Bailan Parchment Grimoire, for which Somdej Pra Puttajarn (Dto) Prohmrangsri is famously known for. This amulet is not only apt for men to wear, but is also highly recommended for Ladies or Children, due to its smaller size. 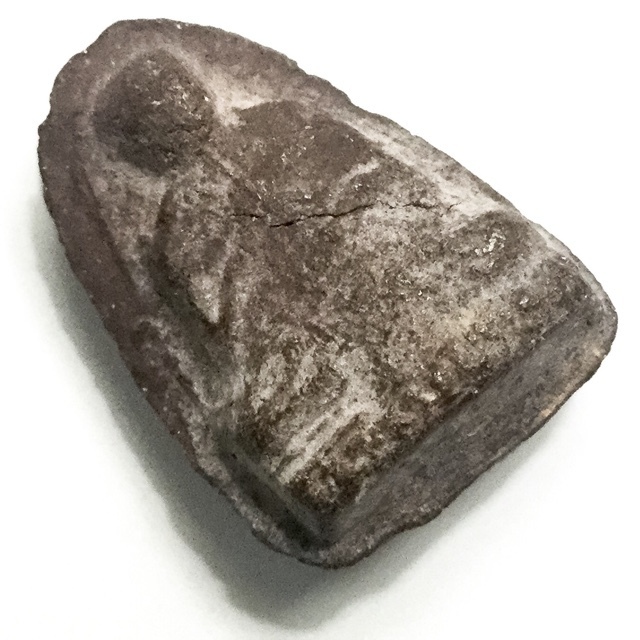 The amulet is a Sacred Powder image, from Ajarn Chum Chai Kree made in 2511 BE. The amulet is covered with 'Kraap Nam Tale' seawater mildew stains. This is an especially preferred and desirable exhibit, due to the highly visible 'Kraap Nam Tale' mildew stains on it. Examples of this amulet which have white salt stains, as visible signs of immersion in the sea, are categorised as 'Niyom' . This means they are the Preferred above others. This Guru Monk Amulet Of historical epic fame, was created by the Great Legendary Ajarn Chum Chai Kiree, in collaboration with his Ordained Accomplice in Sorcery and Buddha Magic; Pra Ajarn Kong, of Wat Ban Suan, and other great Masters. The sacred powder of 108 Kru within the amulet, was made by Pra Ajarn Kong, Por Tan Nam Wat Don Sala), and famous Lay Master, Ajarn Chum Chay Kiree. They had been empowering and chanting into the powders since the beginning of the Indochina War, till the time they made the amulets. The powders included 500 types of sacred magical ingredients, including; Pong Ittijae, Pong Dtinisinghae, Pong Yant Bpatamang, Pong Yant Normo Pra Intr. Ajarn Tong Tao is the Boromajarn root Lineage Master of the world famous Khao Or magical tradition of South Thailand. This is said to have been the most powerful magical lineage of Masters in all Thailand, of all time. Especially in those days, the Lineage and the Samnak was one single Lineage, and extremely powerful. 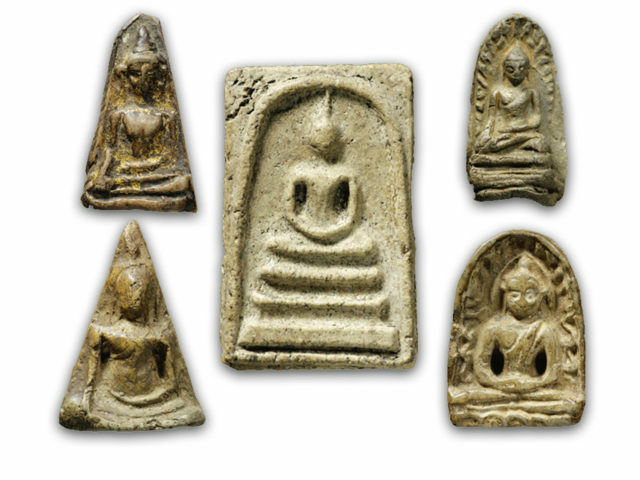 These amulets were empowered and blessed during the famous Wat Tham Khao Ngern Sadej Glab Buddha Abhiseka and Taewa Abhiseka Ceremonies. The Sadej Glab ceremony of Ajarn Chum Chai Kiree is of the most revered, and famous ceremonies and editions of powerful amulets of all the ceremonies attended by Ajarn Kong and Ajarn Chum in that Era, including the Great 2483 BE Indochina War Edition. One part of the ceremony that stands out is the immersion of the amulets in the river, and letting them drift away, and then, setting up a 'Sala Baram Piti' (a sort of small pedestal with a roof on high legs, above water level), which is dressed with white cloth. Then Ajarn Chum would perform the incantations and prayers, to ask the Devas to bring the amulets back ('Sadej Glab', is high speech for high ranking persons or Deities, and means 'To travel back'). The amulets all returned back one by one with the streamflow, and came to rest at the Sala Baram Piti. Ajarn Chum Chai Kiree often performed this method of empowerment in various parts of Thailand at various temples, and every time the amulets would return to their originator, or owner without a single piece missing. Sometimes the distance between the place the amulets were thrown in the river, and where they were recieved, was up to 30 Kilometers away. The Buddha Abhiseka fiinal Blessing after Ajarn Chum Chai Kiree's Impressive Miraculous Empowerment, was performed with one of the largest assemblies of devotees of the various Khao Or Sorcery Lineage Temples of all Ceremonies. It is accepted that the Wat Tham Khao Ngern Sadej Glab Ceremony is of the most Sacred and Important of all Ceremonies performed by the Dtamnak Dtak Sila Khao Or Southern Academy of Sorcery. Important Names Present Were; Pra Ajarn Nam (Wat Don Sala), Pra Ajarn Parn (Wat Khao Or), Luang Por Hmun (Wat Khao Daeng), Pra Kroo Palad Puang (Wat Prasat Nikorn, in Hlang Suan in Chumporn), Luang Por Tan Kloi (Wat Tham Khao Ngern in Chumporn), and of course Luang Por Kong, and Ajarn Chum Chai Kiree. 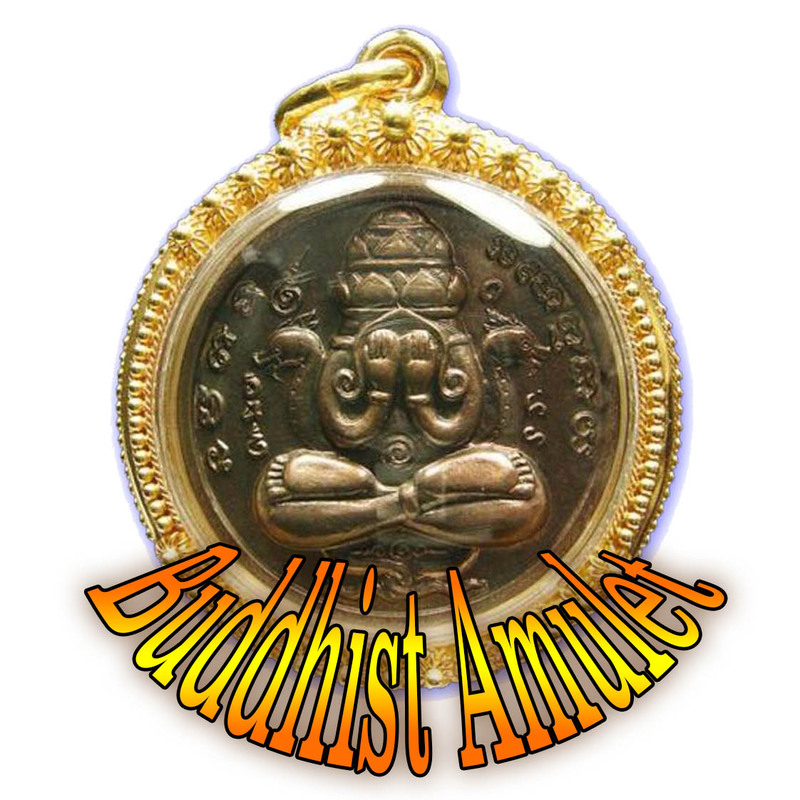 Then pray hard and declare that you take refuge in the Buddha, Dhamma and Sangha, then gaze at the Buddha on the face of the amulet for a moment, before breathing in and saying innerly 'Bud' and breating out and saying 'Dhō' (or Put-Tō, depending on your pronunciation). Ajarn Chum Chai Kiree was the Greatest Laymaster Sorceror of the last Century, and the head Brahman Master of Rituals for the Ordained Khao Or Masters of Wat Ban Suan and related temples. His inimitable ability to invoke both Maha Jang-Ngang Metta Mahaniyom Mercy Cham Magick, and Kong Grapan Chadtri Klaew Klaad Protective Magick, is World Famous and Universally Accepted and Acclaimed. Ajarn Chum Chai Kiree was a Sorceror of truly supernatural ability, who was already immersed in the world of Occultism at the age of 5, and was even then able to use a mere two word Incantation to hypnotize any kind of poisonous snake into submission. Ajarn Chum was arguably the most powerful and famous Laymaster of all Thai Occult History, and his amazing miraculous feats of magickal Prowess are still the talk of every Samnak Saiyasart around the country, many years after his passing. His public shows of Miraculous Magick, has amazed a whole generation of faithful devotees. They are filled with faith in his inexplicable shows of power, and the miraculous events which many people who rever his amulets have encountered, has served to raise Ajarn Chum Chai Kiree to the Status of Grand Master of the Khao or Academy of Occult Sorcery. When Ajarn Chum was just 7 years old, he once grabbed the rifle barrel point of his father's friends gun who had come to visit, and chanted a mere 11 syllable Kata. The gun exploded and broke in half the next time it was used to shoot with. These events caused the villagers to believe in his powers, and have faith in his Magick. When he reached the age of Ordination, he ordained under Pra Ajarn Kong and stayed at Wat Chai Mongkol, until his disrobing. After this, he studied hard further as a Lay Practitioner and studied the Buddha-Dhamma. These events caused the villagers to believe in his powers, and have faith in his Magick. When he reached the age of Ordination, he ordained under Pra Ajarn Kong and stayed at Wat Chai Mongkol, until his disrobing. After this, he studied hard further as a Lay Practitioner and studied the Buddha-Dhamma. Later, he moved to Pattalung, and became a practitioner at the Dtamnak Dtak Sila Khao or, under Ajarn Iad (Wat Don Sala), as his Mentor in Magickal Sorcery. He already had fifteen years of ordained study and practice behind him befriended with the Great Luang Por Kong, and now became the Legendary Master of Khao or Sorcery. The mice ran to the teats of the cat, and the cat gave milk to the mice. Ajarn Chum had a very strange ability to decipher difficult methods of Sorcery and had a special mind that was attuned to mysterious forces. Ajarn Chum had a very strange ability to decipher difficult methods of Sorcery and had a special mind that was attuned to mysterious forces.